Investment in Gold has been and continues to be of prime importance in India. Since ancient times, gold has been considered as a status symbol and a way to show off prosperity. Gold jewellery or precious ornaments has been an all time favourite of a majority of people especially women in India. 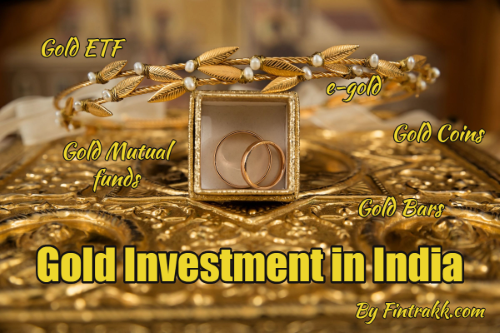 So, we thought to have a look at various ways on how to invest in gold in India. According to data released in early 2016, India continues to be the largest consumer of gold in the world with an annual consumption of approximately 700 tonnes which is more than 1/3rd of global Gold consumption. Clearly Gold can be termed as the biggest asset Indians have invested so far. Why Indians invest so much in Gold? Cultural Reasons: Historically Indians have invested in gold and land ( real estate) as their primary household savings. Gold apart from monetary value has a prestige value and show off value for many households. For some folks at bottom of pyramid, the banking services haven’t reached them so they normally end up saving in the form of gold. Gold black money conduit: Lot of trade in smaller cities in India happens with cash. Gold and cash are easily tradeable outside regular banking system which helps people circulate lot of black money through gold investments. This should not be your intention! Gold a secure Investment : Due to under penetration of non-debt financial instruments in Indian market, Gold is one investment which is considered secure and return worthy. Gold ETFs are a non-physical way of investing in gold, so you do not buy physical gold here. But, you buy a gold backed Exchange Traded Fund(ETF) whose price moves according to the price of gold. So, investing in gold ETFs is akin to investing in gold, its just that you don’t get to keep the yellow metal. It is in a Demat form and is held in your Demat account. Gold ETFs are freely traded in the market. These ETFs are managed by professional fund managers and as such, they entail a management cost as well as brokerage cost which reduces your gains vis a vis physical gold. E-gold is an electronic way to have a gold holding. In simple terms you buy gold, but it’s kept in a Demat form. You can exchange the Demat certificate for gold at any time. Currently National Spot Exchange Limited in India offers e-gold. You can sell e-gold as well as take physical delivery of gold. E-gold generally gives better returns then ETFs in the longer term as there are no annual management fees as in the case of ETFs. Gold mutual funds let you take exposure in securities or shares of companies who are in the business of mining and production of gold. Gold mutual funds and Gold ETFs can have different returns as mining and production business performance may not exactly map to gold prices. ALSO READ The Advent of Robo Financial Advisors in India ! Gold fund of funds basically invests in multiple ETFs. You can then buy these funds and indirectly invest in Gold ETFs. In this way, you do not need to maintain a Demat account to invest in ETFs. You would need to pay some management fee to the fund manager. You can invest in one shot or use trusted SIP way of investing like other mutual funds. If you are really fond of keeping physical gold, you can also invest in gold coins or gold bars. You can buy gold coins or bars from banks or from your local jeweller. Banks normally sell gold coin at a premium ( in most cases 5-7%) and they do not buy back coins or bars. So, buying from banks can be a little tricky because when you need to sell it you will have to go to a jeweller, who prefers buying something from a fellow jeweller because of how gold trade is structured in India. How have you been investing in Gold ? Do you feel gold is a good long term investment option in India? or Do you prefer diversifying and putting your money in different investment options? Do drop in your comments and reviews on the same.